So back in September, I actually forgot that I knit and sew. I had been invited to the dedication of a dear friend's baby around the same time that her other baby had turned 2 years old, and I completely agonized over what to get them for days. What would be special enough for the little one, what would be fun enough for the older one, etc. etc. I finally called my mom for her advice on what to do about gifts for these two little boys and she responded, ".......Couldn't you make them something?" I don't know if in the back of my mind I was thinking that I had already knit them things when they were born so I couldn't play that card anymore, or that they were boys and there was nothing to make them, or what. But.....yeah. Not sure why that was so hard to figure out. Mods: I really just used the ripple stitch pattern from this pattern and didn't follow much else. I did 8 repeats of the pattern and worked until I had a 3ft square blankie. Notes: I cannot say I adored working with this yarn, but as acrylics go, this one was pretty soft and squishy. I do love all the blues, though. Fabric: Some leftovers of a fat quarter for the body and some of an old shirt of Neill's for the insides of the ears. Notes: This was a great, quick project! But I have a question for the sewing experts out there: how is one to press the seams of something when the space for said pressing is much smaller than the width of ones iron? For example, the seam that runs along Wee Peanut's head and nose? Or the space between his little feet? In the end, I believe the little ones liked their gifts. The baby actually wasn't present for the opening of his blankie, but his mama assured me he'd love it. And the 2-year old (who was thrilled to be getting a present in general) opened Peanut then promptly threw him across the room. I think that's a good sign. Lovely gifts! 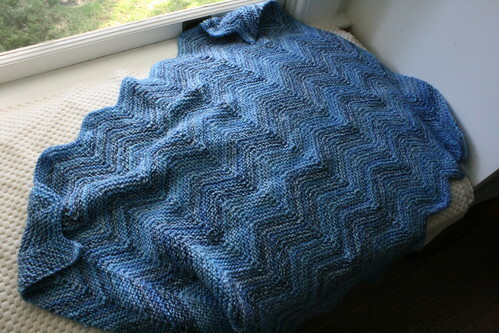 I'm so intrigued by the knit ripple pattern -- I'm lousy with a crochet hook. ha ha, I love the reaction to Peanut the Wee Elephant! The gifts look lovely--I bet mama was thrilled. adorable gifts!! the blanket is lovely, and the elephant is too cute!! Great gifts, the baby won't know and the 2 year old will be pleased. The colours are wonderful on both projects. Wow! Those are both so sweet, I'm not sure which I want to copy from you more :) Peanut is so very adorable. What a great pair of ideas for wee boy handmade gifts! I read long ago on some blog how a little boy had loved his knit blanket so much that he actually had loved it to pieces. All that was left were little scraps. I know your blanket will be well loved too. love the blanket and the elephant! I tried to make that little guy a few years ago and i could not figure it out! maybe i will have to give it another go. I"m totally impressed, as usual. The blanket looks great (love the blues!) 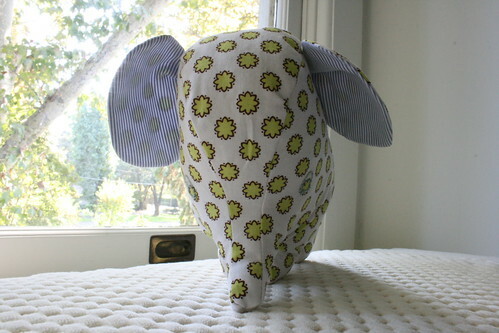 and the elephant is adorable. Glad they were well-received, too! I love the color of the blanket! Hope that helps! Great work! LOVE both projects... i am sure they will both be treasured for years! 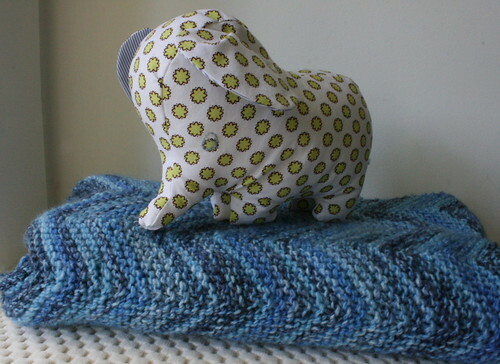 The blanket is a perfect present and I love the elephant as Im sure the 2 year old did.